British car manufacturing declines -4.4% in February to 145,475 units. Exports steady, dipping -0.8%, with more than eight in 10 cars heading overseas. Domestic demand falls for seventh consecutive month, with output for the UK down -17.0%. 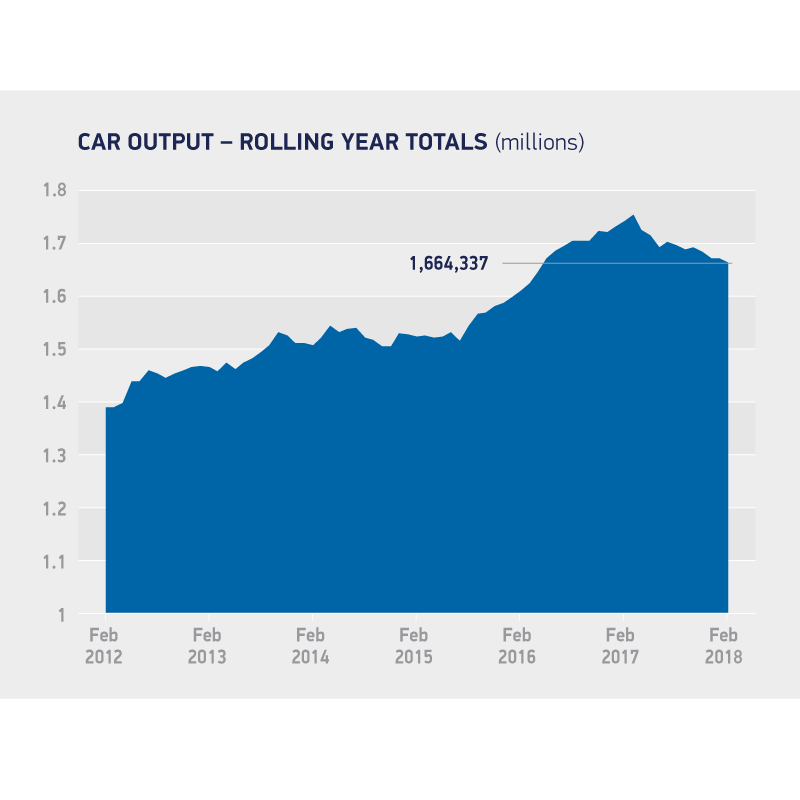 British car manufacturing declined -4.4% in February, as production for the home market fell by double figures, according to data published today by the Society of Motor Manufacturers and Traders (SMMT). Exports also declined, but by a less substantial -0.8%, with 117,139 vehicles shipped overseas, accounting for more than 80% of output. February production for the UK fell by -17.0% to 28,336 units Ã¢ÂÂ the seventh consecutive month of decline at home. In total, 145,475 units were produced, 6,757 fewer than in the same month last year. Overall year-to-date output declined -2.3%, with 292,956 units rolling off production lines in the first two months of 2018, while domestic demand fell -11.9% and exports were steady, up 0.3% on 2017. Another month of double digit decline in production for the UK is of considerable concern, but we hope that the degree of certainty provided by last weekÃ¢ÂÂs Brexit transition agreement will help stimulate business and consumer confidence over the coming months. These figures also highlight the scale of our sectorÃ¢ÂÂs dependency on exports, so a final deal that keeps our frictionless trade links with our biggest market, the EU, after December 2020 is now a pressing priority.